PSALMS 119:105 KJV "NUN. 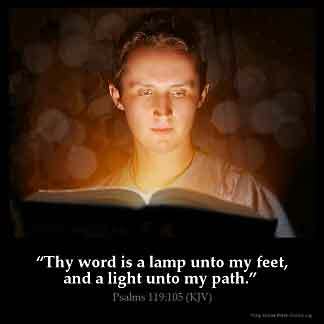 Thy word [is] a lamp unto my feet, and a light unto my path." 102I have not departed from thy judgments: for thou hast taught me. 103How sweet are thy words unto my taste! yea, sweeter than honey to my mouth! 104Through thy precepts I get understanding: therefore I hate every false way. 105NUN. Thy word is a lamp unto my feet, and a light unto my path. 106I have sworn, and I will perform it, that I will keep thy righteous judgments. 107I am afflicted very much: quicken me, O LORD, according unto thy word. 108Accept, I beseech thee, the freewill offerings of my mouth, O LORD, and teach me thy judgments. [NVN.] Thy word is a lampe vnto my feete: and a light vnto my path. NUN. Thy word is a lamp unto my feet, And light unto my path. NUN. Thy word is a lamp to my feet, and a light to my path. [Nun.] A lamp to my foot [is] Thy word, And a light to my path. In John 11:9 Jesus answered, are there not 12 hours in the day? If a man walk in the day, he stumbleth not. In life there is much darkness and the word of God is the only source that will dispel it. There are times we face incredible decisions and we are clueless in the direction we should go. God's word provides that. I think of Isaiah 30:21 "and thine ears shall hear a word behind thee, saying, this is the way , walk ye in it, when you turn to the right hand, and when ye turn to the left". When you go to scripture for your directions, many times that's all you have, and though it might still seem dark, by faith it will light up! When I walk in the light of His word I shall not stumble . The light of His word lightens my way that I should walk therein. I Praise God for His word . I cannot express rightly how much He means to me . I am so Grateful and Thankful for His wonderful salvation He has provided through Jesus Christ . I am Thankful to have a copy of His word. His word will illuminate our way as we are going.waiting on his leading is usually as we go on our journey we invite the Holy Spirit to show us how we can put into practice his word we have hidden in our heart . He wants his light to shine in us and through us and let the sword cut those things out of us that we don't need . This is my favorite verse and I will always charish it's words and love them all of my life!!!!!!!!!!!!! This verse is a true inspiration to me. It reminds me not to worry about my life and go on with my life. Good job!! Now that's a good job!! This verse is a true inspiration to me. It reminds me that I should not worry about my life as long as I sincerely read and follow the bible.